I had a something to do if I had a chance to go to the British Museum again. It's a looking for Rongorongo. When I traveled South America, I found a description of Rongorongo on the page of Easter Island in my guidebook. It says "There are only 20 pieces of Rongorongo in the world. The National Museum of Natural History in Santiago has three of them". When I read it, I thought it should be written on the page of Museum in Santiago, not on the page of Easter Island. Because I had not noticed it when I had visited the National Museum of Natural History in Santiago before I had came to Easter Island. I wrote about it on this page. That's why, I still miss Rongorongo more than 10 years. The British Museum has one piece of Rongorongo. Great! So, I have wanted to look it someday. The picture shows Moai at the British Museum. It's not so good to look Moai in the museum. You should look Moai in Easter Island with the landscape and the air. 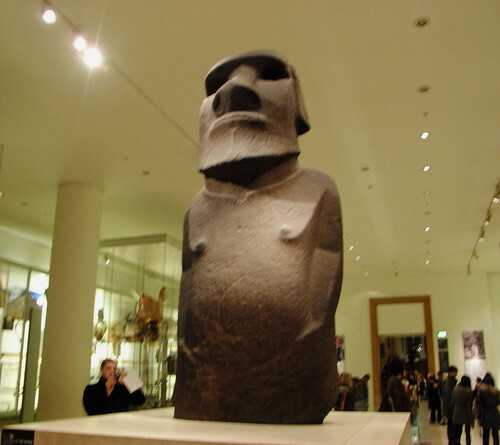 Anyway, so Moai statue was exhibited with various things of Polynesian, but I couldn't find rongorongo in the room.